This work tells the story of a black girl's adoption by a white Scottish couple. The story is told from three different viewpoints - the mother, the birth mother and the daughter. achievement.Jackie Kay is an award-winning writer of fiction, poetry and plays, whose subtle investigation into the complexities of identity have been informed by her own life. Born in Edinburgh to a Scottish mother and Nigerian father, she was adopted as a baby by a white couple. 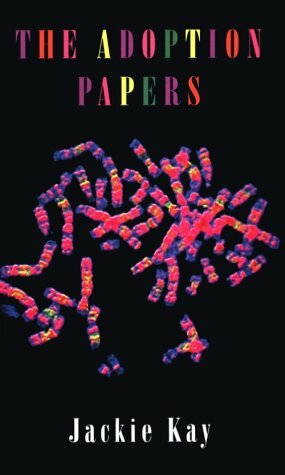 Kay's awareness of her different heritages inspired her first book of poetry, The Adoption Papers, which won the Scottish Arts Council Book of the Year and a commendation from the Forward Poetry Prize judges. Subsequent collections have gone on to win numerous awards, and her first novel, Trumpet, won the Guardian Fiction Prize in 1998. Jackie has also written three collections for children: Three Has Gone and Two's Company, both published by Puffin, and The Frog Who Dreamed She Was an Opera Singer, published by Bloomsbury in 1998 and winner of the Signal Poetry Award. In 2006 Jackie was awarded an MBE. In 2007 she picked up the decibel Writer of the Year prize as part of the British Book Awards. Her plays include Chiarascuro and Twice Through the Heart. She currently lives in Manchester.